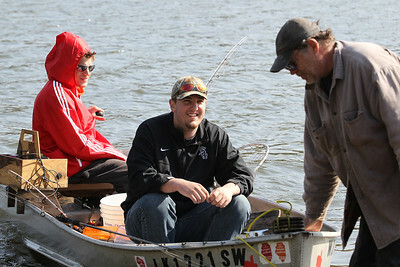 Mike Greene - mgreene@shawmedia.com Lake in the Hills residents Chad Jahnke (left), Tim Benbennick, and Jim Jahnke come to shore after a fishing trip on Woods Creek Lake Monday afternoon in Lake in the Hills. The group, which caught a catfish and a northern pike on this excursion, enjoy getting out to the lake 2-3 times a week in the summer. Mike Greene - mgreene@shawmedia.com Woods Creek Lake offers a variety of recreational activities including boating, swimming and fishing. 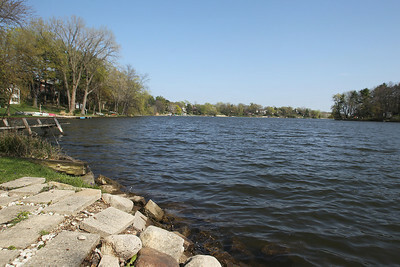 Beginning in June, Butch Hagele Beach and Indian Trail Beach will open to the public for swimming. Lake in the Hills residents Chad Jahnke (left), Tim Benbennick, and Jim Jahnke come to shore after a fishing trip on Woods Creek Lake Monday afternoon in Lake in the Hills. The group, which caught a catfish and a northern pike on this excursion, enjoy getting out to the lake 2-3 times a week in the summer.